← You! The Relationship Destroyer. We are feeling much more than we are thinking. Or should I say we are not thinking nearly as much as we are feeling. This is the breakdown in relationships. Our relationships become broken because of the need to feel cozy and secure in our feelings. The need to have our feelings coddled, emotionally supported, and validated. If our partner steps outside of those limits it is a violation of our emotional expectations. We, in turn, respond negatively because our feelings are hurt. The question becomes what are we doing to get all of these wonderful things to support our feelings? Time is subjective, but how are we spending our time together? Texting? On the phone? Reading updated posts on social media? This is far from the quality time so desperately needed in our relationships. Are we talking to one another? Or are we talking at one another? How much learning time do we put in? How much do we really know about each other? Do we know the struggle? Do we know our partner’s journey? Do we know the outcome? Can we identify the behaviors that come with certain outcomes? There is always an outcome of a trauma each one of us must encounter, but do we really know if the outcome is healthy? Or is our partner damaged, and responds in unpredictable and hurtful ways when his/her feelings have been stepped on? In a relationship we need to know everything there is to know. Why? Because in one way or another, every detail of our outcome will impact each other. We snap for a reason. We cry for a reason. We hurt for a reason. Most often our reaction to a situation today is not so much about the impact of that particular situation today. Often times it is a carry-over (baggage) of a past situation we have not healed from that only compounds as a memory of what has happened today. When in a relationship, we must make it our business to know that about each other. Rather than feeling about a situation and making accusations when we are in conflict with each other; we should ask the question why? The answers of why will lead us down the path of the unknown about our partner. This is the information we need to build a relationship in a deep and meaningful way. A meaningful relationship is much more than about how we feel. It is about “why” we feel. It is going below the surface of who we are with. Knowing not just the details of the past, but the continual impact of that past. We all come with a past. That past is just as present today as it was in its day. Unless we have moved on from the bad of the past— we are living in the present with the scars; and anything can be said or done to re-open that scar. When that happens we become unfamiliar to our partner. This type of unfamiliarity impacts the relationship negatively. If we are familiar with the scars of our partner. If we go deeper than the smile. If we can see beyond the gestures of love. If we can understand how our partner is driven. If we can see the pain that is deeply buried and seek to understand why it is still there. It is then and only then are we going below the surface and can expect the unfamiliarity— because we are familiar with the “why”. Meaning, rather than trying to figure out what happened. Ask the question of why it happened. Question how an argument could have been avoided. Or did it have to happen in order for us to learn each other? Either way, we will learn just a little bit more of what we didn’t know before. This will only work when we put the feelings to the side and think simply by asking the question. It is very difficult to think— before feeling. 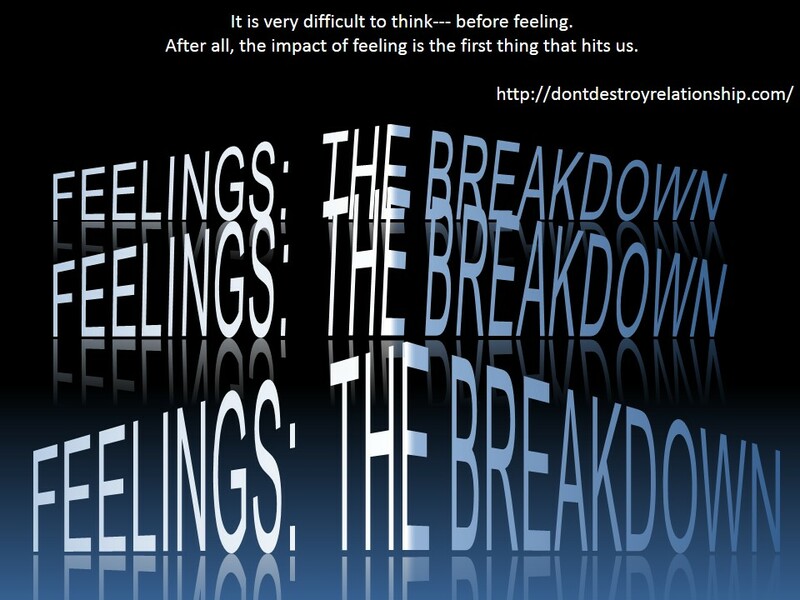 After all, the impact of feeling is the first thing that hits us. Being continually shaped by society to be self intensely involved is leading to dysfunctional relationships. We aren’t really getting deep enough in our relationships, and we wonder why they do not last. To prevent relational breakdown is to think first— rather than feeling first. This entry was posted in Emotions, Settling and tagged book, broken relationship, hurt feelings, past hurts, thinking to feeling. Bookmark the permalink. Hello My Friend! Long time no see! LOL It has been a long year. I lost my grandmother, and made some transitional changes among other things. How are you? Still keeping it gully?